This is the last PoP feature I’m going to run. As popular as this feature has been (??! ), it’s time to wind it up and move on to other distractions. In fact, I was going to stop at the top 5 but I know that all those PoP-lovers out there (??!) have been waiting for one face to turn up. Or should that be, one “Face” to turn up! (Ga-zing!) That’s right, the tied-for-6th-position inductees into the Pantheon of Plastic are Dirk “Faceman” Benedict and his A-team-mate, Mr T! Dirk Benedict shot to fame as wisecrackin’ cigar-chompin’ X-Wing pilot James T. Starbuck, fighting the evil Stormtroopers while seeking a final refuge for the Rebel Alliance. For one glorious season he smirked his way through the galaxy, trading gags with the tin dog, and then returning for some TV movies. Benedict hasn’t been pleased by the revival of his classic show, but maybe that’s just sour grapes because a google image search on Starbuck doesn’t feature him nearly as much as it once did, and also includes a giant left-liberal coffee chain. At least he doesn’t have as much to complain about as his old co-star Richard Hatch, whose dogged determination over decades to revive the show was completely thwarted by some other people who came in and re-imagined it. 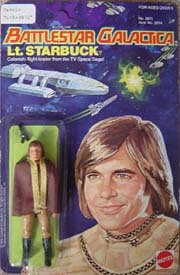 More important source of Hatch disgruntlement: in the 1978 action figure series, they never made one of Captain Apollo. You could buy his best friend, his dad, his enemies and that random insect that was a baddie in one episode, but him, the co-lead? No! Poor Richard Hatch. Benedict made a similarly lasting impression as the ultimate smooth operator, “Face”/”Faceman” in soldiers-for-hire the A-Team. The team specialised in rescuing kidnapped children, and escaping from fully-supplied mechanical workshops, but Face was basically there to woo the ladies (on-screen ladies, and those watching at home). As a kid I always wondered why he was called Face, because his Face didn’t seem to come off or morph into anything, and as superpowers went “having a face” wouldn’t even get you an interview for the Great Lakes Avengers. Now I understand: it’s because you want to slap his smug face every time he opens his mouth, right? Right? Mr T needs no introduction, for he is loved by all. “Pity the fool” comes from the Rocky III script. Here is a post from 2007 with some great Mr T amazement. Mr T actually makes more sense as an action figure who is made into a person, than as a person who is made into an action figure. Which seems as good a place as any to stop this madness. So that’s enough of that. Posted by morgue on Wednesday, May 12, 2010, at 9:37 am. Filed under And also. Tagged pantheonofplastic. Follow any responses to this post with its comments RSS feed. Both comments and trackbacks are currently closed. I loved Freaked, though I wish it had retained the original title of Hideous Mutant Freekz. Great P-Funk theme song, too. Mr T has nothing on Dirk Benedict. 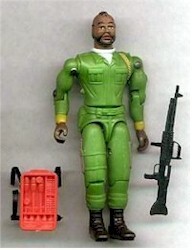 I had those A Team action figures. 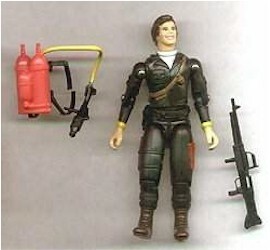 I had those A team figures too. When tryign to validate my earlier calls for Mr benedict to be included in the Pantheon, I did find an image of a twin pack of BSG figures featuring Starbuck and Apollo. I will send it to you. But it’s a much later release! So I guess Richard Hatch eventually could feel satisfied that he was given a plastic incarnation – but unless there’s a Tom Zarek figure out there, he’s stuck outside the pantheon still. Do Lego figures count? I have seen a Tom Zarek/Laura Roslin double pack. I just read the entire Dirk Benedict backlash article. “There was a time – I know I was there – when men were men, women were women and sometimes a cigar was just a good smoke. But 40 years of feminism have taken their toll. The war against masculinity has been won. Everything has turned into its opposite, so that what was once flirting and smoking is now sexual harassment and criminal. And everyone is more lonely and miserable as a result. Weirdly, my crush on Starbuck *almost* transferred onto the remake… Starbuck was still the most awesome character until she went too mystical at the end (and the end soooo sucked).